In the months after the burial of John Williams at the crossroads in Shadwell on 31st December 1811, some further evidence came to light. A search of The Pear Tree revealed a jacket with a bloodied pocket, blood stained trousers abandoned in the privy and a bloody French knife hidden in a mouse-hole – the knife that could have been used to slit the victims’ throats. However none of these items could be incontrovertibly connected to John Williams. Most interesting was the testimony of the Captain of the Roxburgh Castle upon which Williams and William Ablass had sailed together out of Rio de Janeiro. They were a very bad crew, with Ablass – a violent character among the very worst of them, imprisoned in Surinam for leading a mutiny. Ablass was held in chains on suspicion of being Williams’ accomplice to the Shadwell murders but released without sufficient evidence to charge him. The two men escaping up New Gravel Lane after the murder of the Williamsons were described as one short and one tall, but both Williams and Ablass were tall, which means if Williams was guilty then Ablass must be innocent, it was concluded. The converse deduction was not addressed. In writing these episodes over the last month retelling the story of the Ratcliffe Highway Murders, I am primarily indebted to the conscientious work of P.D.James and T.A. Critchley in their shrewdly written book The Maul and the Pear Tree published by Faber & Faber, which stands as the definitive account, and I strongly recommend it to all who wish to learn the fuller story. In 1811, the systematic approach to crime solving that we recognise today – of suspects, clues, motive and alibi – was simply not in existence. Yet P.D.James and T.A. Critchley succeed in organising the arbitrary random scraps of evidence that survive into a coherent picture on the lines of our modern approach, and creating an exciting narrative in the process. 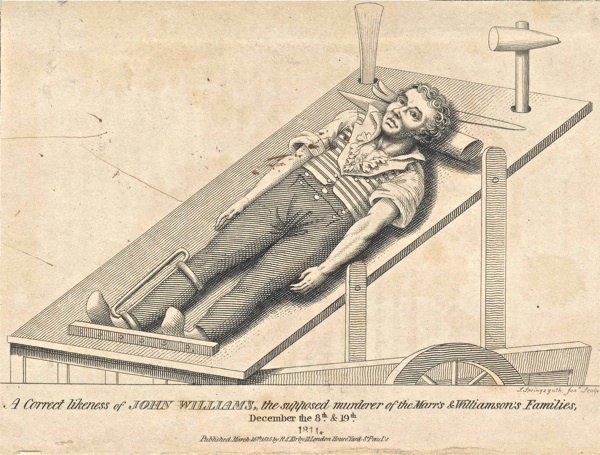 They suggest that John Williams himself could have been an eighth victim – despatched by the killers in a staged suicide to shut him up and prevent their detection. Though to my ears this sounds overly contrived, after studying this story, I understand that it is irresistible to speculate upon a mystery that remains one of the greatest unsolved crimes in our history. You must read the book and draw your own conclusion. Both multiple murders were on commercial premises within a quarter mile of each other and there is sufficient evidence to confirm more than one culprit. Immediately, this excludes the notion of a random diabolic psycho-killer on the loose and instead suggests organised crime, a protection racket of intimidation – which is entirely credible in such a bad neighbourhood with a high proportion of transients and little policing. It is likely that Mr Marr knew that the oyster shop and bakers would be shut when he sent Margaret Jewell, the servant girl, out on 7th December, because he needed privacy for whatever negotiation was to take place with his expected guests at midnight. And in doing so, Mr Marr saved the girl’s life. It is possible that Mr Marr took the chisel himself – when it went missing – to keep it as self-defence from persons unknown. This would explain its re-appearance on the night of the murder and why it was clean and untouched with blood. It is established that Mr Marr was in debt and sailed on the Dover Castle with Cornelius Hart, the carpenter who used the chisel to construct the new shop window and who was connected to the Pear Tree through John Williams. To me, there is the hint of a hidden narrative here weaving these characters together, and maybe of the resurgence of some old grievance from Mr Marr’s seafaring days. Intimidation alone cannot account for the extremity of the violence, but it could if the negotiation had turned bad and led to the killing of Mr Marr and his shop assistant, and then Mrs Marr too as witness. If there happened to be an unhinged individual with a violent murderous tendency among the group - someone like William Ablass – that alone can explain the murder of the baby. In this context, the Williamsons’ subsequent murder may be comprehended as damage limitation, if somehow they had learnt the truth of the earlier killings. It appears that a principal witness, Mrs Vermilloe, the landlady of the Pear Tree, had been intimidated or threatened and also that she was convinced of the innocence of John Williams. To me, John Williams’ suicide speaks of his expectation of the outcome of any trial, irrespective of whether he was guilty or innocent. He took his own life rather than live through the ordeal that he knew lay ahead. This fascinating tale – of which we shall never know the truth – speaks of a Britain not so long ago when the metropolis grew rapidly and the first national media had come into existence but there was no police force yet. Nowadays, Mr Marr’s financial dealings and phone records could be scrutinised, and the maul analysed for fingerprints and DNA, and the Ratcliffe Highway (now known simply the Highway) has CCTV cameras installed. It was the widespread public unease generated by this case, driven by the universal terror of killers in the night and encouraged by the press reports that turned the Ratcliffe Highway Murders into the first national crime sensation, which contributed directly to the establishment of the Metropolitan Police in 1829. Such was the association with violence that the name of “Ratcliffe” was dropped from maps over time. Today, traffic thunders along the Highway past the headquarters of News International, occupying the site of former London Docks just fifty yards from the location of the Marrs’ shop. 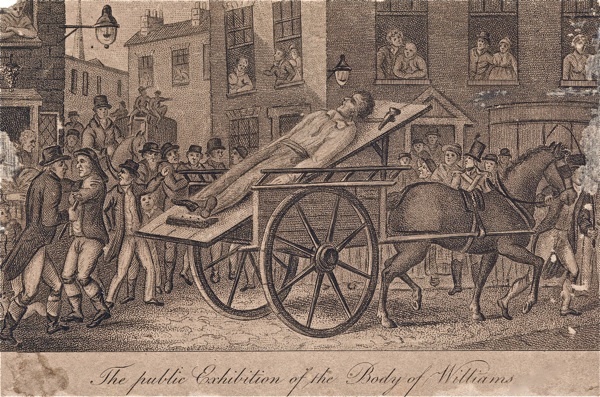 John Williams’ body was exhumed a hundred years later when a water main was installed in Cable St and his skull was kept for many years as a curiosity behind the bar in the public house at the crossroads. In recent years, The Crown & Dolphin has been converted to flats but I have not been able to discover what became of the skull. Does anyone know? 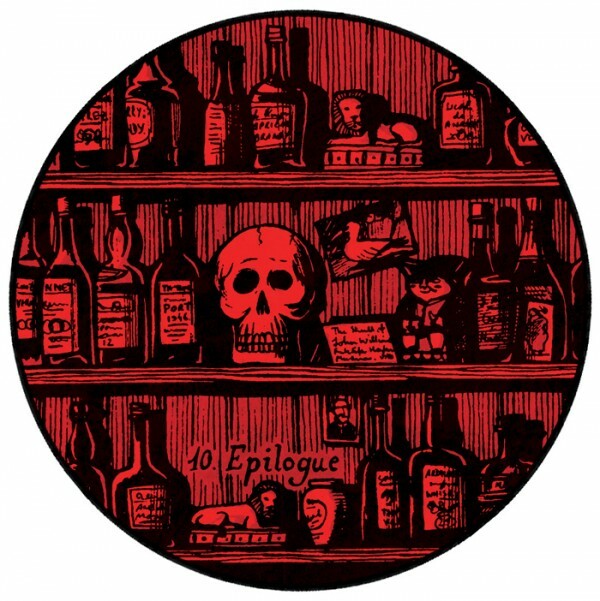 The Maul & The Pear Tree - P.D. James’ breathtaking account of the Ratcliffe Highway Murders, inspired me to walk from Spitalfields down to Wapping to seek out the locations of these momentous events. Commemorating the bicentenary of the murders this Christmas, I have been delighted to collaborate with Faber & Faber, reporting on these crimes on the exact anniversaries of their occurrence. 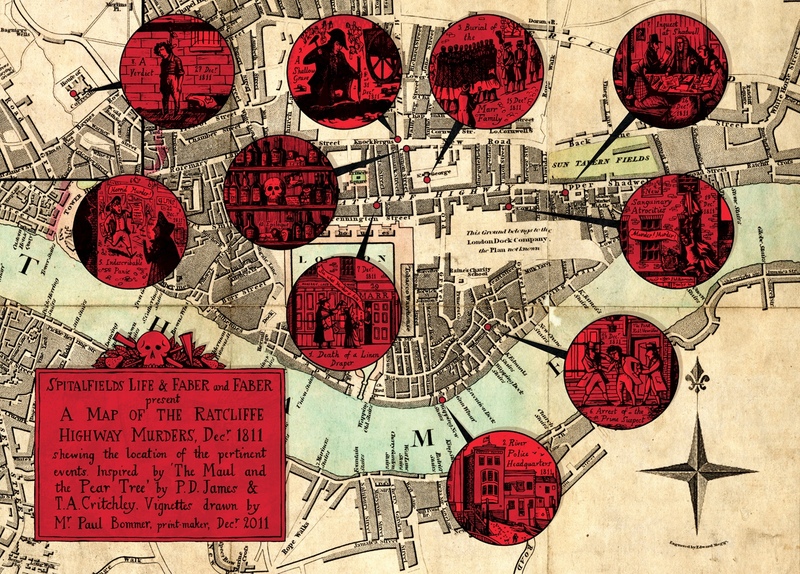 The Map of the Ratcliffe Highway Murders – In collaboration with Faber & Faber, Spitalfields Life commissioned this map from Paul Bommer. Once you have clicked to enlarge it, you can download it as a screensaver or print it out as a guide to set out through the streets of Wapping. Thanks to the Bishopsgate Institute and Tower Hamlets Local History Archive for their assistance with my research. Interesting how the name “Ratcliffe” was dropped because of its associations. I live near what was 10 Rillington Place which was renamed Ruston Close in May 1954 after residents petitioned the council for a name-change to deter sightseers. This didn’t have the desired effect as people could find it easily enough despite the name change and so the whole lot was pulled down at end of 1970. Seven years later the present development, including Bartle Road, was completed, but in such a way as to obscure the position and layout of the old road, thereby preventing a newly-built house being blighted by being readily identifiable as occupying the same spot upon which the old house once stood. 25 Cromwell St was pulled down leaving no trace of Fred and Rose West’s murderous address. I wonder how many places have such notoriety that the name or even the whole place has to be made to disappear. Thanks so much for this serial, I have really enjoyed reading the installments and will surely seek out the P.D. James’s book. I’ve loved reading this intriguing tale – beautifully written and redolent of shady times. Thank you! My husband had an ancestor who gave her birthplace as Ratcliffe in the 1851 census, and for the longest time I could not find out where in London it was supposed to be despite my very good knowledge of the city! That it was dropped from maps now makes perfect sense! After reading the chapters on your blog, I bought P D James’ book and have just finished it. You’re correct, it is a breathtaking account and I love the thinly-veiled hints she gives about her despair over the primitive methodology of the ‘investigation’! The chapters on your blog has greatly enhanced my understanding of the case. History is always brought alive with a ‘then’ and ‘now’ comparison – ‘living history’ at its best. Thanks!